Added Value & Structural Integrity. Replacing your roof is a beneficial alternative to spending thousands on endless, costly repairs and it will add value to your home. Replacing your roof is probably one of the biggest investments to consider. An expense this large can become daunting when it comes time to search for the right price and the right company. That is why when you choose to work with Ridgid Construction we combine both affordability and quality for every job. Our honesty and integrity lie within our work, and we truly believe that by advising customers to follow through with the proper upkeep of their roof we will help them avoid costly repairs and even unnecessary roof replacements. We can accurately determine the strength, stability and overall condition of your roof and be able to best advise you on whether or not you need a full replacement. We specialize in roof replacements all throughout Oklahoma, including Oklahoma City, Norman, Edmond and surrounding areas. Call us today for a free estimate in your area. We look forward to hearing from you! We re-roofed this home with GAF Timberline 30 shingles in Weatheredwood. Gutters were replaced and interior damage repaired as well. If you have a roof leak and wood rot or either of the two, sometimes the damage is severe and become far too expensive to fix. 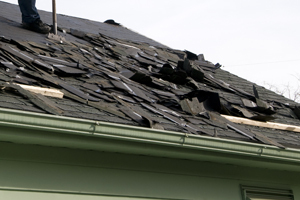 Any damage done to your roof, whether it is from a storm, heavy winds, or just everyday strain, can rack up hefty costs, which is why total replacement is often times best. You don’t just want a contractor that has all the right certifications and licensing. While those licenses and certifications are important and crucial to the company’s existence in the first place, reliability, credibility and the relationship you build with a company is far more important than anything. Here at Ridgid Construction we pride ourselves on providing unmatched customer service and quality, reliable solutions. We want to work WITH you to achieve the results you want, with a price you can afford and be satisfied with. If you live in Yukon, Moore, Mustang, Bethany, El Reno, Choctaw, Newcastle or any other area in Greater OKC, call us today to schedule a free on-site inspection and detailed estimate.